ABOVE: The German Emigration Center is located on the waterfront in Bremerhaven, Germany, where more than seven million Germans, Scandinavians, and Eastern Europeans left for the New World by ship. From 1830 to 1974, more than seven million emigrants departed on ships from Bremerhaven, Germany, on their way to the United States, Canada, and other countries in the New World. Today, Europe's largest emigration museum tells their story through a series of compelling exhibits. The Deutsches Auswanderer Haus, a.k.a. the German Emigration Center, is located in Bremerhaven's New Harbor, where some 1.2 emigrants left for the Americas and Australia between 1852 and 1890. The museum opened in August, 2005. Over the next five years, the German Emigration Center earned a "European Museum of the Year" award and welcomed more than a million visitors--including many foreign tourists of German, Scandinavian, and Eastern European ancestry. The three-story museum offers a "tour through history" that draws on the biography of an individual emigrant. When you enter the museum, you receive a "boarding pass" or electronic ticket with the immigrant's name on it. During your visit, you can use the electronic boarding pass to hear audio recordings about the emigrant, his or her family history, and descendants who are alive today. The Deutsches Auswanderer Haus or German Emigration Center is open every day of the year. Hours are 10 a.m. to 6 p.m. from March through October and 10 a.m. to 5 p.m. during the winter months. The last admission is one hour before closing, but we recommend allowing at least 90 minutes for your visit. 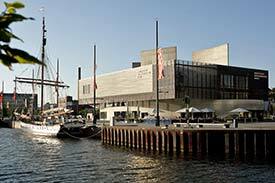 The museum offers a variety of ticket prices and packages, such as family tickets and "CombiTickets" that include admission to the German Maritime Museum in Bremerhaven or the Jewish Museum Berlin. You'll also find a shop, a restaurant, and a "Kindermuseum" with children's activities. For more details, see the "Information" page at www.dah-bremerhaven.de. To view more captioned pictures of the museum, go to page 2 of this article. Tip: Allow time for a visit to the Klimahaus Bremerhaven 8° Ost climate museum, which is just next door. Photos copyright © Deutsches Auswanderer Haus.